When we unveiled our "Next 5%" goal last year to increase U.S. Dairy exports, we could not have anticipated retaliatory tariffs on U.S. dairy products in two of our most important markets, China and Mexico. But that's what has happened. I want to address the tariffs and our plans moving forward. VIDEO BELOW: Secretary Vilsack discusses Mexican and Chinese tariffs. VIDEO ABOVE: Click arrow, lower left. On Monday, China retaliated to escalating tariffs by the Trump administration with new tariffs of its own on $60 billion of U.S. exports, including certain dairy products. China canceled planned talks with the U.S. and issued a 71-page white paper stating, "China does not want a trade war, but it is not afraid of one and will fight one if necessary." Unfortunately, I see no end in sight for this escalating trade tension between economic superpowers. This could have long-range negative effects on the U.S. dairy industry because China is a vital growth market, a key to our future plans. In 2017, we sold $577 million in dairy products there, an increase of 49 percent over the previous year. With 1.4 billion mouths to feed, the long-range upside for U.S. Dairy in China is huge. We project it's only a matter of time before China becomes the world's largest cheese importer. But if tariffs against U.S. dairy products remain in place, they will tilt the playing field to our competitors' advantage. Mexico is also crucial to our future success. It's our No. 1 market, where we sold $1.2 billion in dairy products and ingredients last year. Despite a preliminary handshake agreement in August between the U.S. and Mexico, we don't have a modernized North American Free Trade Agreement yet. Negotiations between the U.S. and Canada continue, with Canada's unfair protectionism of its dairy industry a major issue. I am more hopeful about tariffs lifting in Mexico than China. If our government ends its steel and aluminum tariffs on Mexico, this may ultimately lead to Mexico's elimination of retaliatory tariffs of our exports. Why should anyone outside our industry care? This is an important question to answer as policymakers focus on trade like no time in recent history. We have a strong economic argument to make. Ongoing tariffs would not only hurt dairy, but the larger agriculture sector and the broader U.S. economy. Dairy supports 2.9 million jobs nationally, creates $64 billion in tax revenue and is increasingly dependent on exports for future growth. What's more, increasing exports spark economic expansion. Consider our exports to Mexico. Every $1 of U.S. dairy exports to our neighbors south of the border generates $2.50 of economic activity here in the United States, more than double our bang for the buck. These trade policy challenges raise understandable questions about The Next 5%, our farmer-funded, supplier-supported goal to increase U.S. dairy exports. Is it still realistic to think we can grow export volume from roughly 15 percent of U.S. milk solids to 20 percent over the next three to five years? Are we still moving forward on The Next 5% investments, particularly in China, where the trade policy disagreements have the potential to drag on for some time? With so many U.S. dairy farmers financially struggling at a time when most of the U.S. economy is thriving, is this the time to expand overseas? My answers, in order, are: Yes, Yes and Yes. We must increase exports to keep our farmers in business and our factories humming. As the chart below illustrates, we can't rely on our domestic market alone. The gap between what we produce will get wider and wider, adversely affecting our industry. Increasing exports help fill the gap. The first half of 2018 was the most successful half-year in the history of U.S. dairy exports. U.S. dairy exports of milk powders, cheese, butterfat, whey and lactose topped 1.14 million tons, a record high and up 20 percent from the prior year. Exports were equivalent to 16.8 percent of milk solids produced during the period. We have established momentum. 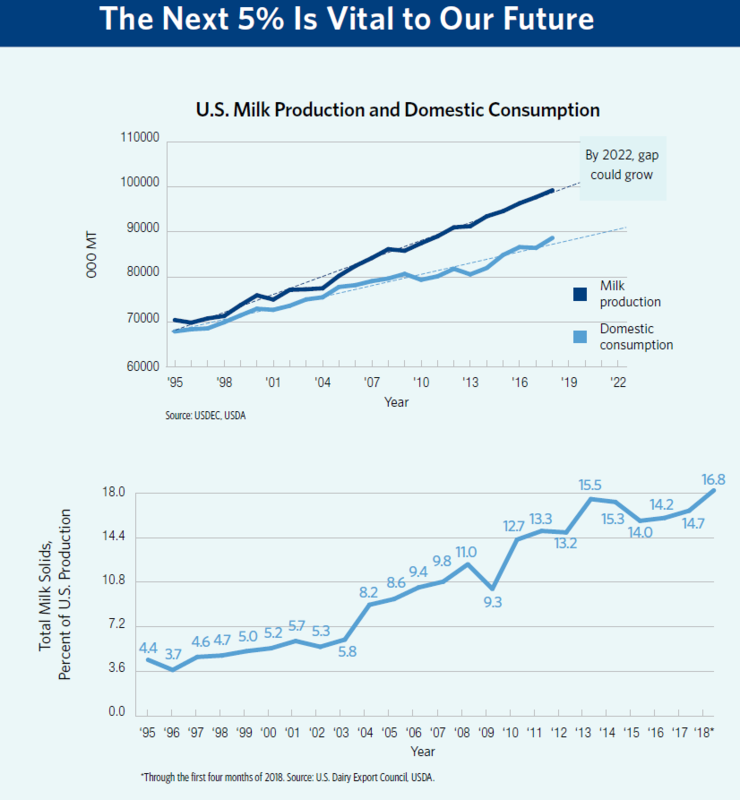 Looking ahead, we forecast the world will need an additional 1.3 million metric tons of dairy products to meet global demand growth over the next three to five years. With generous help from our farmer-funders through the checkoff program, we believe U.S. suppliers can increase cheese exports by 200,000 tons and dairy ingredient exports by 450,000 tons. This is how we get to The Next 5%. There is no doubt that the new tariffs have been a significant setback. An Informa Agribusiness analysis commissioned by USDEC predicted Chinese tariffs on U.S. dairy products will cost U.S. dairy farmers $12.2 billion by 2023 if they remain in place. Read more here. Those estimates were made before China upped the ante with this week's new tariffs. It would be easy to shrink back at this moment, or at least take a breather. But the world needs U.S. dairy and we need the world to expand our industry and increase milk prices for our farmers. Recent investments in establishing The Next 5% have been made possible with increased support from our parent organization, Dairy Management Inc., along with state and regional dairy organizations funded by the dairy checkoff. We are grateful for this support. Our opinion at USDEC is that our efforts in pursuit of The Next 5% now become even more important. We must continue to aggressively tell the U.S. dairy industry story. Our mantra for 2018 and 2019 is "more, new and better" in all of our markets, including China and Mexico. I can guarantee that we know how important our work is to make sure our dairy producers and processors have a brighter and better future. Tom Vilsack is president and CEO of the U.S. Dairy Export Council. He is a former U.S. Secretary of Agriculture and a governor of Iowa.